Today we’re welcoming guest blogger Melissa Graham, a former attorney who found more joy in the kitchen than the courtroom. These days, in addition to being the founding Executive Director of Purple Asparagus, Melissa also speaks and writes regularly on child nutrition and sustainability both in the Chicago community and online. In 2005, I left behind my first career as a big firm attorney to found Purple Asparagus, a non-profit organization dedicated to educating children, families and the community to eating that’s good for the body and the planet. In the beginning, we organized events that introduced children and families to the pleasures of the table. Our mission soon expanded to include advocacy and education in the schools. Six years later, we’ve worked with thousands of parents and children at public schools, community centers, and farmers’ markets throughout Chicago and its surrounding suburbs. Purple Asparagus’ educational program, Delicious Nutritious Adventures, is based on the simple notion that if you eat close to the ground, incorporating lots of diverse fruits and vegetables into your diet while getting the processed junk out, you’ll be well on your way towards a healthy lifestyle. At Purple Asparagus, we don’t view food as simply fuel or nutritional building blocks to feed the body. Food can be, and should be, more than that. We believe that sharing food, at least good, clean food, can strengthen family and community ties. The roots of this notion dig deep into my childhood. Through my parents, I was exposed to good food both in fine restaurants and in clam shacks. Growing up near the bounty of the Atlantic on Long Island instilled in me a respect for local and sustainable products. We clammed, caught crabs, and gathered beach plums that we transformed into jam. Each Labor Day, we traveled to the island’s east end returning home with bags heavy with local corn, peaches, and tomatoes. While my mother wasn’t a food snob and often used the tricks of the processed food industry, she also froze, canned, and dried the gifts of the growing season. Through food, we explored the world and connected as a family. Having long since moved from Long Island and my parents, my husband and I continue these traditions here in the Midwest. My son, age seven, is already an old hand at navigating the farmers’ markets. Our weekly, sometimes bi-weekly, visits have created so many wonderful memories, including trying his first strawberry plucked straight out of a pristine pile by the farmer, or his market play dates with the daughter of another farmer who lives in the same small Indiana town as my husband’s relatives. We too explore the world and connect as a family through food. While we’re not perfect, we do our best to consume food that is good and clean, raised by farmers and producers whose practices replenish the earth. Asparagus in Ambush was a popular cocktail appetizer in the 1950’s. I resurrected it recently for our family dinner updating it by using the purple variety, my favorite. It was a big hit on our table. 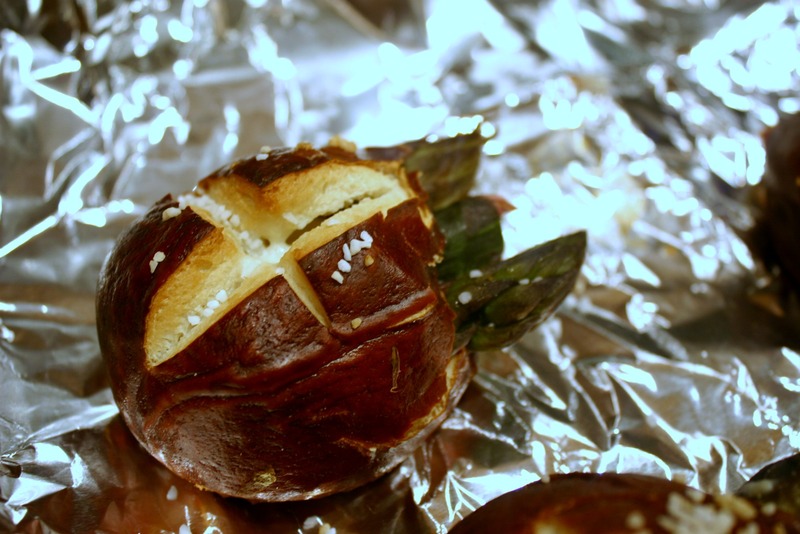 Preheat the oven to 325 F. Steam the asparagus and cut into 4 to 5 inch lengths. Heat the butter in a small saucepan over medium heat. Add the green garlic and sauté until fragrant. Stir in flour and cook for another 3 to 4 minutes. Pour in wine and let simmer for 3 to 4 minutes. Whisk in milk and simmer until the sauce is thickened. Add parmesan and ham and remove from the heat. Cut a slit in the top of each roll and pull out some of the bread from the center. Fill each roll with the white sauce. Stick the asparagus spears into the sauce and place on an aluminum foil lined baking sheet. Bake until toasty and bubbling about 10 minutes. This entry was posted in In the Kitchen (recipes & more) and tagged asparagus, delicious nutritious adventures, local food, melissa graham, preserving food, purple asparagus, Real Time Farms, sustainable. Bookmark the permalink.